William Shakespeare stories at Techdirt. 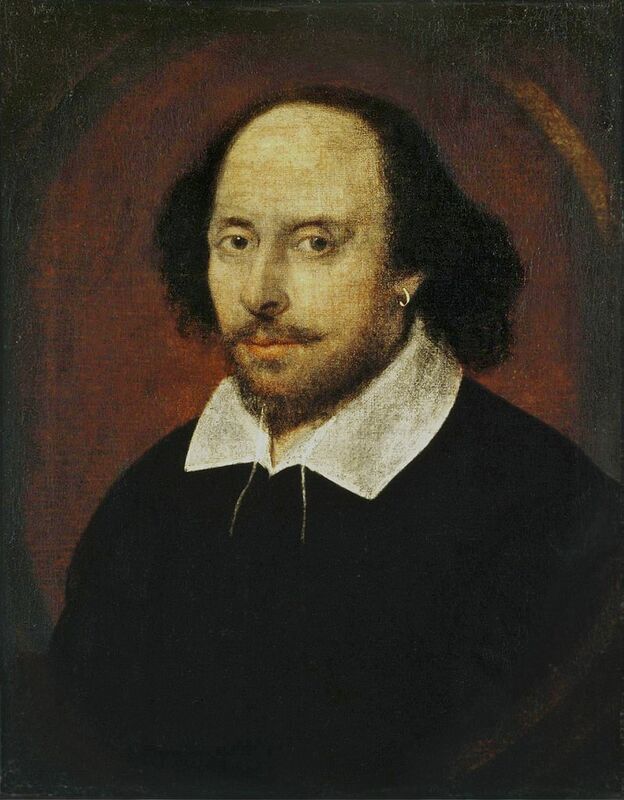 stories filed under: "william shakespeare"
Why Is The UK's Intellectual Property Office Praising National Portrait Gallery's Copyfraud Claims Over Public Domain Images? 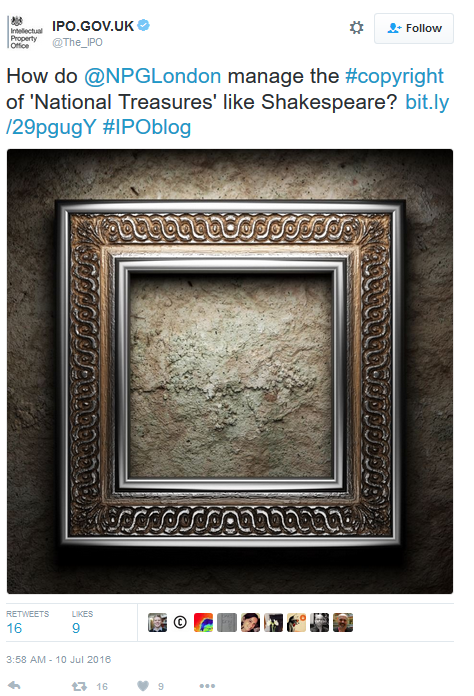 That's a tweet from the UK's Intellectual Property Office (IPO) asking how does the UK's National Portrait Gallery in London "manage the copyright of national treasures like Shakespeare?" My initial response, of course, was "Wait, Shakespeare is in the bloody public domain, you don't have any copyright to manage!" It seems rather easy to manage "the copyright" of Shakespeare when there is none. But it turns out the link is... even worse. It's to a blog post on the IPO website eagerly praising the National Portrait Gallery for engaging in out-and-out copyright fraud. You'd think that the Intellectual Property Office would recognize this, but it does not. According to the gallery’s most recent statistics – the top five individual portraits licensed from its website are, in descending order: William Shakespeare, Richard III, Queen Elizabeth 1, King John and King Henry V.
Obviously, all of those portraits were created centuries ago -- and are in the public domain. So why is the National Portrait Gallery licensing them at all? Well, I'm pretty sure this goes back to an issue we've written about quite some time ago. While in the US the caselaw is clear that merely digitizing public domain images does not create a new copyright, the National Portrait Gallery in London has always taken the opposite view. Back in 2009, we wrote about this very same museum threatening Wikimedia Commons for posting scans of high resolution images of public domain works that were downloaded from the NPG's website. However, according to the Court of Justice of the European Union which has effect in UK law, copyright can only subsist in subject matter that is original in the sense that it is the author’s own 'intellectual creation'. Given this criteria, it seems unlikely that what is merely a retouched, digitised image of an older work can be considered as 'original'. This is because there will generally be minimal scope for a creator to exercise free and creative choices if their aim is simply to make a faithful reproduction of an existing work. Online availability and easy access to images and other data are crucial aspects of modern museum and library curation. Huge databases of valuable information are available. Users need to know where to find these resources and how to use them without infringing copyright. Museums and libraries are developing strategies to improve access for researchers, to give access to businesses users who want to develop their own intellectual property (IP) by using cultural resources and develop their own brands and merchandising. Mathew Bailey, Rights and Images Manager at the National Portrait Gallery, balances the high wire between providing public access to our shared national assets and the need to encourage, develop and supply the creative economy with legally certain, quantifiable, marketable IP. The commodity he deals in – our heroes – couldn’t be more volatile. It’s no accident the names of the artists who painted the UK’s top five portraits are uncertain - King John looks like he’s just sat on a thistle, whereas Richard III only half fills his canvas. The lives of Richard III, King John and Henry V were all dramatised by Shakespeare during the reign of Elizabeth I. She was an image conscious monarch in the first age of mass communication and Shakespeare was her blockbuster dramatist. Shakespeare’s narratives add value and are the real reason why he, Richard, Elizabeth, John and Henry are still top of the portrait pops. It didn't occur to Dan Anthony, who wrote this article, to recognize the absurdity of the fact that the National Portrait Gallery is claiming a copyright in works where it doesn't even know the name of the artists who created those works? Holy crap. How does the UK IPO find these people? All images © National Portrait Gallery, London. You can find it, accurately listed as being in the public domain over at Wikipedia. Dan Anthony at the UK IPO is incredibly misinformed, and he should ask his own colleagues, who just months ago made it clear that such images were in the public domain, before posting such ridiculousness on the IPO's website.